My friends Bethany and Daniel, founders of Technology Will Save Us, have developed the "world’s first active wearable that kids, young and old, can make and code themselves." It's called the Mover, and it looks like a lot of fun to build, program, and use! The Mover Kit is part iconic accessory and part education tech toy. 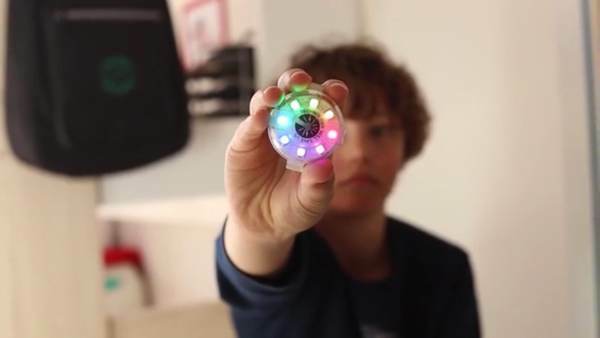 It is the latest make-it-yourself kit from the award-winning London startup Technology Will Save Us, who make amazing products designed around kids getting creative with technology. The Mover Kit is a little different from their other kits as it encourages imagination and play through movement and activity. All the while, it teaches kids fundamental skills around programming, electronics, and how to solve problems creatively. Tech will Save Us tested prototypes with over 300 kids, and learned that kids love technology that they can wear as it allows them to be engaged and active while having fun. They used this feedback from kids to define the form factor of the Mover Kit -a wearable. The technology they chose - motions sensors, a compass, and rainbow lights - gave kids responsive, active and stealth learning experiences. And they wanted to keep using it again and again. The Mover Kit also comes with access to a digital platform called Make, which provides endless ways to create games, costumes and inventions with the Mover Kit – from making brushing teeth more fun, to inventing a light sabre or kaleidoscope. The core of the Mover Kit is its rainbow-colored lights, which respond to movement. Kids think of tons of ways to invent and move to trigger the lights. What I love about the Mover Kit is that it encourages what comes naturally to kids: active play. It makes learning and being active fun. The Mover Kit launches on Kickstarter today with special pricing beginning at $45, a 40% discount off retail. Backers that pre-order now can expect delivery in the fall 2016.